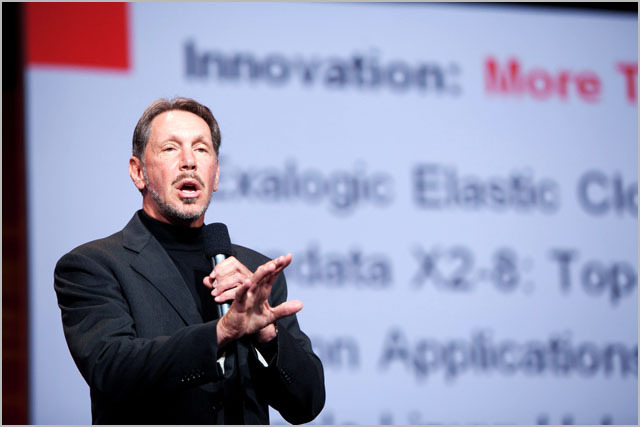 news Enterprise technology giant Oracle has published details of half a dozen sizable deployments of its technology by Australian customers, as it continues its push to convince local technology buyers of the popularity of its Fusion platforms. The first example listed by the vendor in several statements published in late April relates to professional body Engineers Australia, which Oracle said had implemented the 11g versions of its BPM, WebLogic, SOA and E-Business suites to support its online eChartered platform. According to Oracle, the system, which went live in early 2013, provides new online self-service capabilities which significantly improve the user experience for the group’s members replacing many cumbersome manual processes. The solution has resulted in enrolment processes being completed “90 per cent faster than before”, while staff can generate assessment reports in “seconds rather than 45 minutes”. The organisation has also cut the time taken to develop new system modules by three to four weeks. “Oracle offered a more comprehensive, cost-effective, and long-term solution than other middleware vendors,” said Richard Holmes, MIS Renewal Program Manager, Engineers Australia. In another example, wagering giant Tabcorp revealed that in 2012 it deployed Oracle’s WebCentre, Service Bus, Coherence and WebLogic tools to support its popular website. Online transactions currently account for more than 20 percent of the company’s wagering revenue, and the company needs to support extreme peak transaction loads — processing more than 50 million transactions in one day on Melbourne Cup Day, for example. On Melbourne Cup Day the group’s site hits 1,000-plus transactions per second. Oracle’s web solutions also proved popular in a similar deployment Pickles Auctions, which rolled out the vendor’s BPEL Process Manager and WebCentre Content solution, also running on WebLogic. “We needed rock-solid middleware products that would help manage and support 200 million website hits, 350,000 unique visitors, and around 1.4TB of auction-related data every month. The resulting robust performance and high availability of our new site, means our customers can confidently register for auctions and access online data about products. By providing a reliable, up-to-date auction Website, we have improved customer satisfaction, maximised revenue, and enhanced market competitiveness,” said Harry McKenzie, Chief Information Officer, Pickles Auctions. Another organisation to have recently deployed an Oracle solution is Griffith University, which has been working on a new students enrolments interface for several years. In February the institution sent a new Programs and Courses Website and Enrolments system live, using WebLogic and the SOA Suite, as well as Oracle’s Data Integrator solution and its PeopleSoft Campus platform to do so. “Our new student enrolment system and website breaks new ground in usability, efficiency, design and simplicity, ensuring that Griffith students have a unique and fulfilling experience every time they interact with the university to manage their study program. Built on top of Oracle PeopleSoft Campus Solutions and leveraging Oracle’s middleware products we have the enterprise scalability and reliability we need to support the peak loads we experience during student enrolment,” said Steve Bishop, Associate Director, Enterprise Information Systems, Information & Communication Technology Services, Nathan Campus, Griffith University. In the retail sector, Oracle revealed that skincare company Jurlique recently expanded its use of Oracle SOA to streamline integration with its new Shop Floor Management system, which replaces manual dispensing of work orders, and provides real-time integration to JD Edwards. The company is also upgrading JD Edwards to the EnterpriseOne version 9.1.2. The company had initially adopted Oracle’s SOA suite in 2010 to automate its online ordering process, after it experienced large growth in its sales due to being featured on The Today Show in the United States. The company is also using Oracle software to allow staff to process sales orders on mobile devices. Lastly, contractor management services group Entity Solutions used Oracle software as it expanded its EntityOnline contractor portal, aiming to help its corporate customers more easily access information about their contractors. The site acts as a self-service portal for more than 2,000 contractors who interact with EntityOnline to manage their contracts and information. The company used Oracle’s WebCentre, SOA, WebLogic and Data Integrator suites, as well as the vendor’s Application Development Framework. “We had a number of goals at the start of the project – to improve the customer experience for both our contracting professionals, and the public and private sector organisations who utilise their services, to streamline the interactions and to scale to cope with burst periods. Oracle’s integrated middleware suite has helped us build a professional portal with a modern look and feel, incorporating content from many different sources presented through mash ups that we can be proud of,” said Jonathan Knowles, CIO, Entity Solutions. What I find interesting about these rollouts on the part of Oracle is the degree of systems integration of traditional corporate software which it appears was necessary in all of these cases. Over the past year or so, I think many of us have gotten used to seeing a lot of rollouts of enterprise IT software along the software as a service model — or what is commonly termed cloud computing. It’s now normal to see an organisation deploy a platform such as Salesforce.com to their business very quickly, with customisation for their particular business needs, and most of the vendors providing these sorts of services have moved to integrate them with other slabs of commercial software as well as making certain elements of their SaaS platforms open to development work (for example, Salesforce.com’s Force.com platform). What we’re seeing here from Oracle is the reality that out there in the wild, there are still many significant traditional IT projects being deployed, with on-premise deployment models and external third-party contractors needed to integrate the vendor’s software into enterprise environments. Although you could describe each example as using ‘out of the box’ software, the reality here is that none of these deployments are as completely ‘out of the box’ as the very standardised solutions being provided by SaaS vendors. In fact, if you read the details of the rollouts above, you could be forgiven for thinking the cloud computing/software as a service revolution wasn’t happening at all, and that traditional vendors such as Oracle still own every aspect of the market with their traditional on-premises software. Despite all the hype about cloud computing, this is perhaps the reality of the enterprise IT software market: Mostly still stuck along traditional lines. It will be interesting to see how long it takes before the majority of these kinds of corporate software deployments are driven from the cloud. A survey of 63 Australian CIOs across a range of sectors that I conducted in February revealed a slightly surprising picture of the reality of ICT management compared to media hype. While alternative sourcing approaches such as shared services, outsourcing, and cloud services are much discussed at conferences and in the media, the reality for this group of CIOs is that ICT management is still about managing the people, processes, and technologies of the in-house ICT department. Hence traditional ICT software and hardware implementations from the big global vendors (such as Oracle as per your comments above Renai) remain the ‘main game’ for most large enterprises. Change, however, is definitely coming, while perhaps more slowly than expected, and momentum for cloud services in particular is expected to build during the next few years. ICT remains predominantly an in-house affair. 74% of all ICT activities are currently provided by an in-house ICT department, although this is projected to decline to 61% during the next few years. Shared services arrangements account for around 9% of ICT activities, and this is not projected to change much during the next few years. Outsourced arrangements currently account for 13% of ICT activities, and this is projected to rise to 20% during the next few years across a range of services – primarily focused on data center, network, and application development services. Around 4% of ICT activities are currently sourced as cloud services – primarily software-as-a-service (SaaS) applications – but overall this proportion is projected to rise during the next few years to 10%, primarily for data center infrastructure-as-a-service (IaaS) and applications and end-user services (SaaS). Cloud sourcing of data center and application services, in particular, is expected to rise to over 15%.